“The chain of tradition”, included in David Raphael, The Expulsión 1492 Chronicles, Carmi House Press, 1992, pp. 178-79. 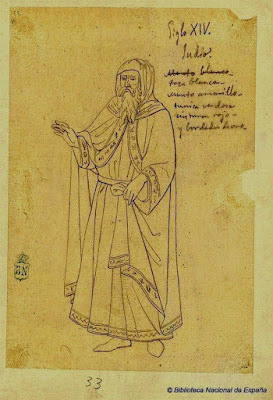 Picture of a drawing by Manuel Castellano (1846-1880). Title: Attire. It is specified in the note on the upper right hand that it refers to Jewish clothing in the 14th century.